The Ducati Vintage Club (DVC) is for anyone who owns or is interested in 1988 or older Ducati motorcycles. If you restore, ride or race a vintage Ducati single or twin near the San Francisco Bay Area you've found the right place. We also have booths at local shows such as Quail Motorcycle Show (Carmel Valley, Calif.), Bikes on the Bay Motorcycle show (Soquel, Calif.), the IMS Cycle World International Motorcycle Show and we run the annual European and Japanese Motorcycle Show and Swap usually on the last Saturday of March at the Santa Clara County Fairgrounds in conjuction with the several other motorcycle shows and racing venues on the same day being part of the “Motorcycle Extravaganza” at the fairground. The DVC will be expanding various activities including a yahoo group, occasional newsletters, meetings and social gatherings, local rides, tech sessions, and local event participation. An electronic newsletter (optional) for all members featuring news from the current racing forum, vintage racing news and tech stories including articles of interest to the vintage collector. 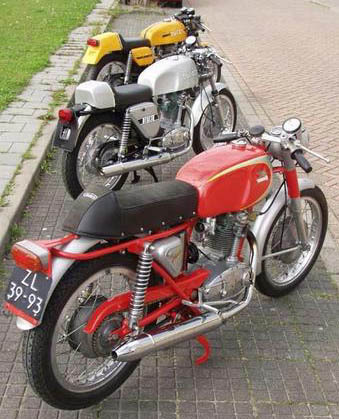 Yahoo groups (Bevelheads, Vintage Ducati and Ducati Vintage Club) offers forums for vintage Ducati owners and admirers to network on help, locate hard to find parts and the advice and comments of members from around the world, which includes years of personal experience and technical know how. Local rides are planned, along with the clubs involvement in the Giro d'California vintage motorcycle event. The club has also participated with the Motogiro America, which occurred in July of 2008. Tech and tune up sessions occur on most Wednesday evenings at local shops and are announced via the DVC monthly electronic newsletter. This activity is a DVC members-only privilege and by prior approval. The level of involvement is purely a matter of choice and optional for all members, but to fully enjoy your vintage Ducati, to indulge in the enriching experience that vintage motorcycling can bring, you are earnestly invited to attend, participate and enjoy the Ducati Vintage Club.